Andy Warhol began his monumental Marilyn Diptych, 1962 in the months immediately following the actress’s untimely death in August of that year. A dynamic juxtaposition of celebrity and tragedy, the powerful artwork combines the aesthetics of tabloid print with religious iconography for a stunning homage to one of Hollywood’s most fascinating icons. The summer of 1962 was one of the most pivotal artistic periods in Andy Warhol’s luminous career. In August of that year, he began to experiment with skill screening, a process that would come to define his oeuvre with its industrial, manufactured quality. In Marilyn Monroe, he found the perfect subject for his new medium, an extraordinary embodiment of the cult of celebrity and the shadow of tragedy – his two artistic obsessions. From the time of Monroe’s death until the New Year, Warhol created 20 silkscreen paintings based on a publicity photograph of Monroe from the 1953 film Niagara. Among these, Marilyn Diptych, 1962, a haunting mixture of vivid color and ghostly black and white that resides in the permanent collection of Tate Modern, London, is the pinnacle. ANDY WARHOL, SILVER CAR CRASH (DOUBLE DISASTER), 1963. SOLD AT SOTHEBY’S NEW YORK FOR $105.4 MILLION IN 2013. Warhol repeats Monroe’s face 50 times across the two panels that compose Marilyn Diptych, 1962, in five columns by ten rows. On the left panel, Monroe’s iconic visage is rendered in vivid, almost garish hues: bright yellow for her hair, pink for skin, blue on her heavily lidded eyes and a reddened lip set against a glowing orange background – a striking hyperbole of the opulence of celebrity. As with his Campbell Soup Cans or Brillo Boxes, he has chosen an image so ubiquitous in popular culture as to become simultaneously unseen or unregistered. Monroe’s famed countenance is but one more mass-produced image in Warhol’s artistic lexicon. In its slight variations and saturated tones, the left-hand panel presents not the likeness of the woman herself, but a mask that is inscrutable, impervious to the gaze, and only heightens the distance between the viewer and the figure. In stark contrast, the right-hand panel presents the same repeated image in silver under-paint with black overlay. The silver hue obliquely references Hollywood’s “silver screen,” while also calling to mind the repetitive printings of black-and-white tabloid papers. Through Warhol, Monroe’s death haunts the painting. Black ink pools thickly, obliterating her face, or renders too faintly, resulting in a barely visible impression of the actress disappearing from the canvas. The serial repetition takes on the sinister quality of the very tabloid papers which both tortured her life and glamorized her death. This assembly-line sameness exploits the silkscreen method, and its commercial roots. Warhol worked in advertising before he turned to fine arts. 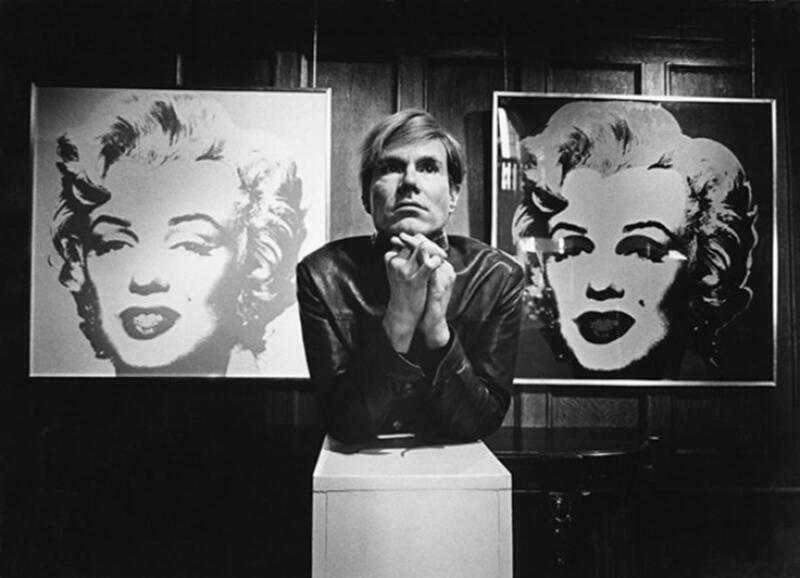 The son of Slovakian immigrants born in Pittsburgh, Pennsylvania, on 6 August 1928, he attended Pictorial Design from the Carnegie Institute of Technology and in 1949, Warhol moved to New York, where he became one of the most successful and imitated illustrators of the 1950s, with clients that included Harper’s Bazaar and Tiffany & Co. Images of Chairman Mao with blue shirt on a blue background. And yet Marilyn Diptych, 1962 transcends the contemporary. In the work’s two-panel format, Warhol recalls Byzantine and Renaissance Christian religious devotional imagery of saints, which often positioned the Virgin Mary on one side and the crucified Jesus on the other. In this way the opposing panels were a commentary on the relation between Monroe’s life and death, as well as an idolization of celebrity.